I went to the garden at about nine, which is pretty early for me, especially on a Saturday. Other gardeners were coming to help me with some projects, but they hadn’t arrived yet, so I set to work smoothing out some pathways and filling in low spots in the garden. 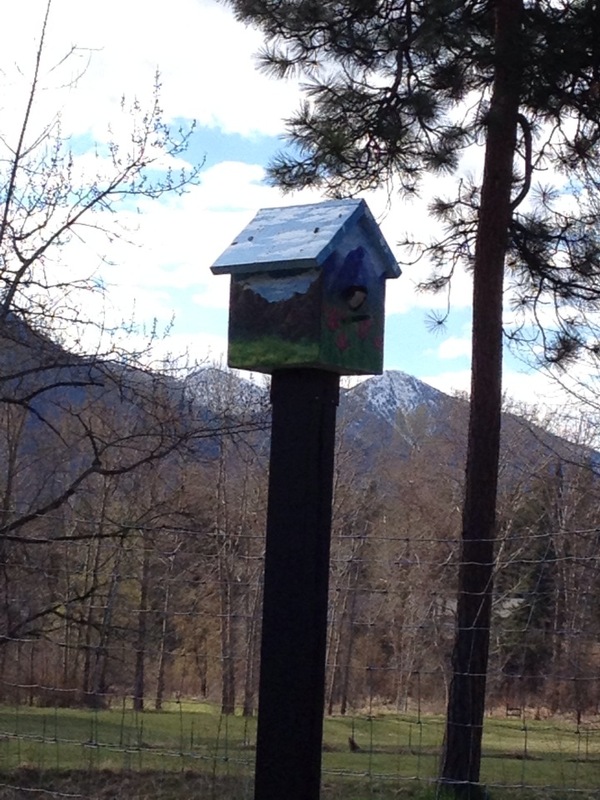 A bit hard to see, but we have swallows living in our Garden birdhouse! The parents were yelling at me a bit when I came too close, and occasionally swooped around my head. I tried to keep my distance. My next task was to use stakes and twine to cordon off Potato Place and the Strawberry Patch. 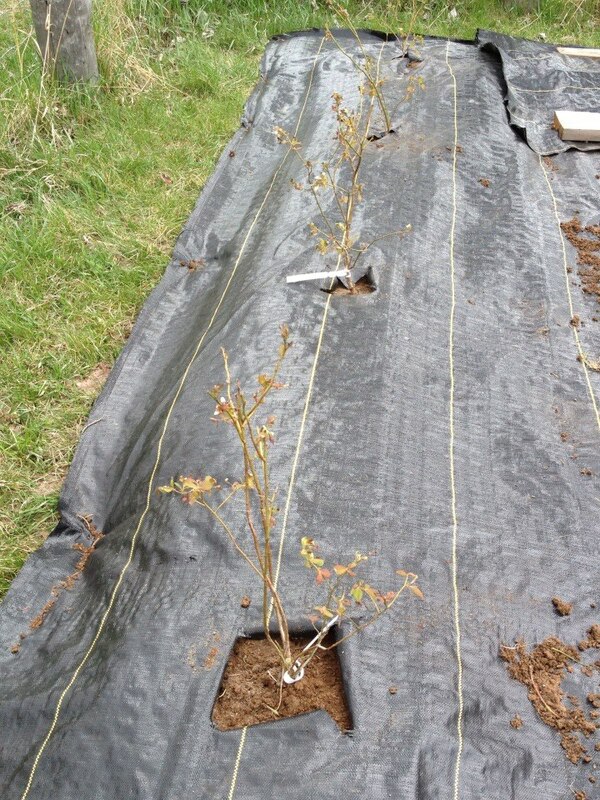 Then I finished laying the landscaping fabric that outlines the individual plots. I also had the opportunity to speak with some nice people in the community who were walking by and put them on our waiting list. While I was doing that, Lucy and Andrew and their beautiful children showed up, and Andrew immediately got to work digging out the grass in Raspberry Row. (Thank you thank you thank you!!! I was dreading having to do that). The kids had fun digging in the dirt and finding worms. And it is so much nicer to pull grass roots when you have someone to chat with! 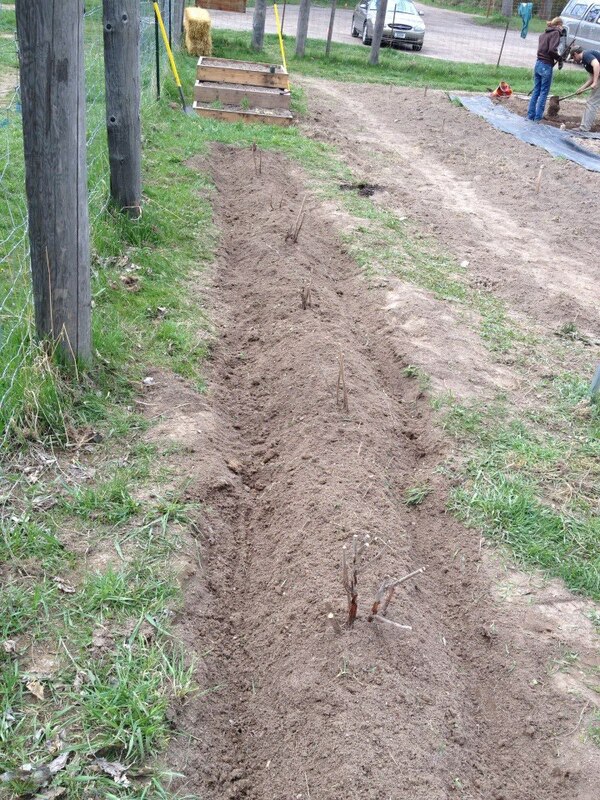 Adam arrived, and helped finish digging the Row, and then Andrew planted the raspberry canes. 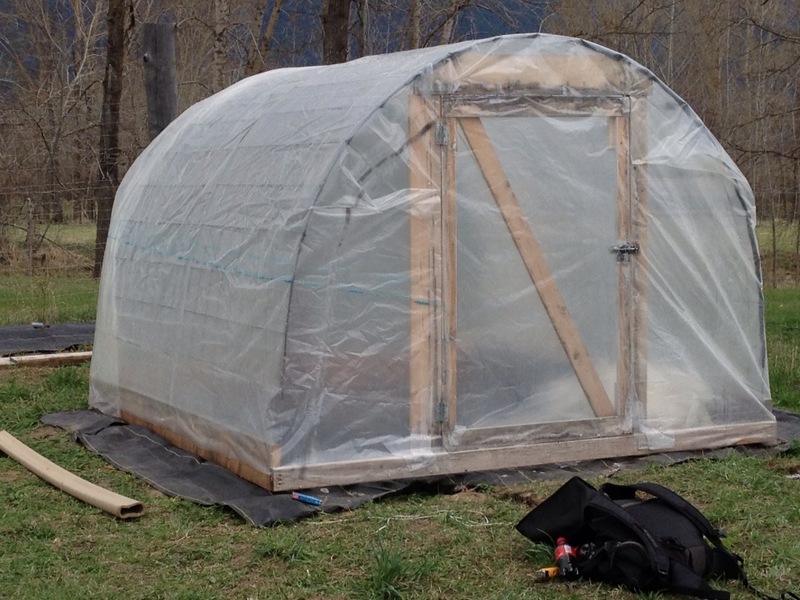 My husband and eldest son put the plastic on our homely but useful greenhouse. Eric, my husband, then organized the garden shed. He took a lot of garbage out, and hopefully did not contract hanta virus. Thank you! This was another job I wasn’t looking forward to. Plot holders were in and out of the garden all day. 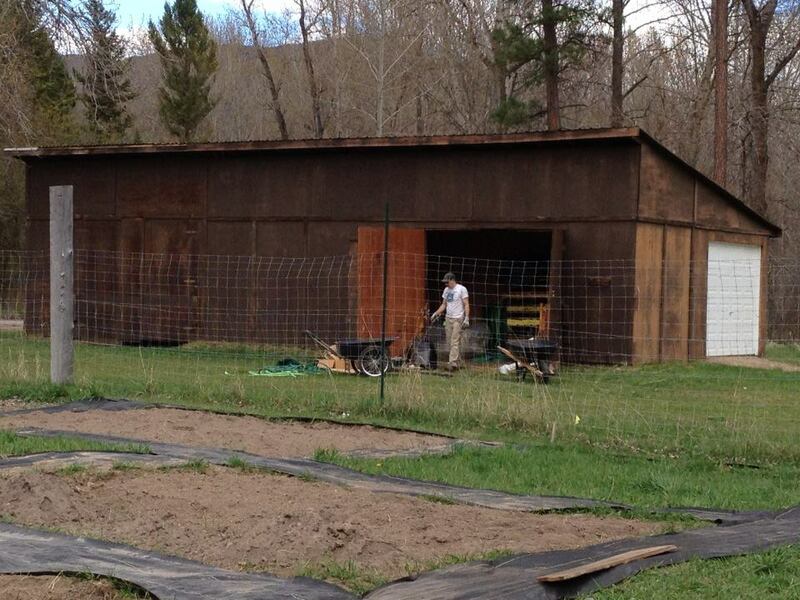 Adam worked on his plot, Erin and Kyle came down to pull grass (a never-ending chore) and to plant potatoes in nifty chicken wire cages. That is something I am loving about this season in the garden–everyone has so many cool ideas to share. Janina and Brian worked in their plot for the first time. Marlene and David and their children arrived as I was getting ready to trim and worked to eradicate grass from their plots, too. As for me, I planted strawberries, weed whacked the garden, and watered my seeds and new plants. It doesn’t look like much when I list it that way, but I am exhausted and just a little bit sunburnt. Tomorrow I will go back to replant a few onion sets that didn’t survive the cold weather, and to perhaps plant a few things in my own plots. The 10 day weather forecast is looking good–highs in the 60s and 70s with lows in the 40s. Works for me! 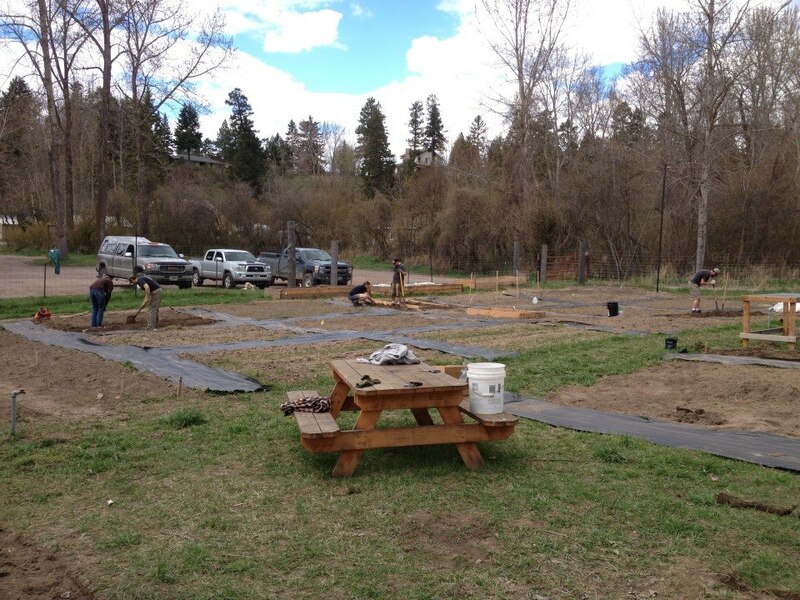 This entry was posted in Columbia Falls Community Garden, Gardening. Bookmark the permalink.